Host Andy Steele and others at AE911Truth are on their way to Philadelphia to educate AIA members about WTC 7 and Resolution 16-3, which will be voted on at this year’s conference. The resolution invites convention delegates to support the call for a new investigation into WTC 7’s destruction on 9/11. 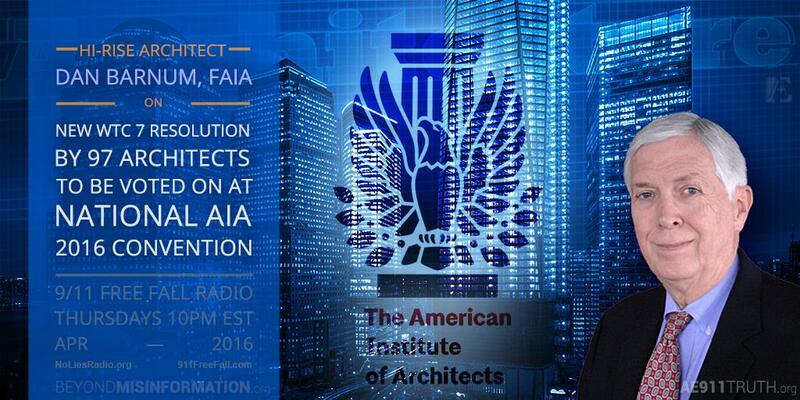 In this week’s rebroadcast from last month, AE911Truth Board Secretary Dan Barnum, FAIA, explains why the American Institute of Architects should vote “yes” on the new-and-improved resolution that he and 96 other AIA members are sponsoring. Next week 9/11 Free Fall returns with an all new episode featuring guest Ted Walter, to discuss the outcome of the resolution vote. This show was broadcast on May 19, 2016. This entry was posted on Wednesday, May 18th, 2016 at 11:27 pm	and is filed under 9/11, 911 Free Fall, Education, False Flag/Fake Terror, Freedom, Justice, News, Protest, Science. You can follow any responses to this entry through the RSS 2.0 feed.